I've been doing some thinking lately. There are so many things that I want to achieve in life, and not a single one is going to be ticked off the list if I'm spending my weekends curled up in bed with a packet of chips and Netflix. Something high up on my list is to develop my hand lettering. A few of you will know that I love writing. Not creative writing (I'm terrible at that) - but just the act of putting pen to paper. I love neat writing even more. You know, during one of my job seeking phases, I saw an ad for a card writer. Yes - the main responsibility of this job was to hand write cards (whaaaaaaat!!??). Birthday cards, congratulations you're having a baby! cards, every card you could possibly think of. Despite being something that I loved doing, i didn't apply for it. It offered less hours and lower pay than my (then) part time job and it just didn't make financial sense to apply. A few nights ago, I found a calligraphy pen and started playing around with different quotes. Sure I can make normal hand writing look neat on paper, but one thing I was never good at was calligraphy and joining different letters together. But as with everything, I would never get better at calligraphy if I sat around and did nothing. So this weekend was a little more productive than usual and it was spent developing one of my passions. Above is one of my favourite quotes from this weekend. 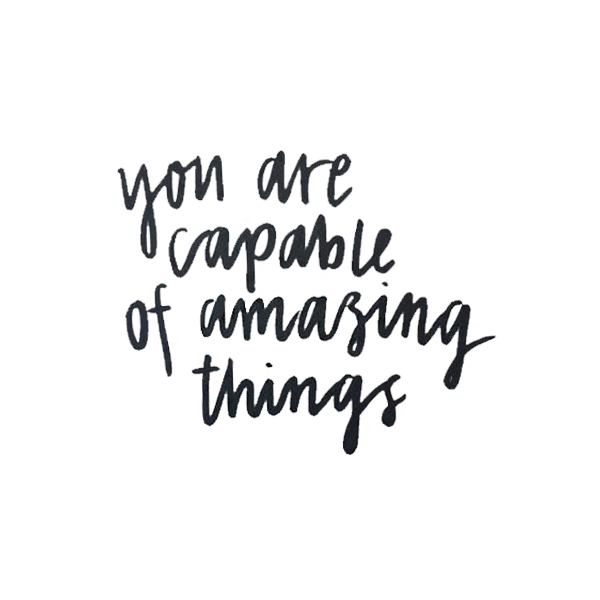 You are capable of amazing things - you just need to stop thinking and start doing.